As it turns out when I entered the last Unofficial, Official Animator Dominator Contest on GoAnimate I meant to let you know the results but didn't. Quite remiss of me considering I won and was crowned the new Animator Dominator. If you're not familiar with this competition then here's some background. Originally the competition was inspired by an animation by skits called Ryco vs Ro (two high profile GoAnimate members) where viewers could vote for who they thought would win. A debate then ensued. The comments on the animation show that Ryco was inspired by Ludvig's rules to actually attempt an animation based upon them. From there Ro soon followed and the informal competition was on. The winner was determined by community vote. You can follow what happened in this forum thread on GoAnimate. In the end Ryco emerged victorious and became the first Animator Dominator. From those small beginnings the competition has grown with each new Animator Dominator devising the rules and when the next competition is actually run. As far as I know I am the third title holder, with GoAnimate member, Mojochi, being the previous winner before me. So that's the history as far as I know it. Last week it was my turn to launch my version of the Animator Dominator contest which I did with the animation below. 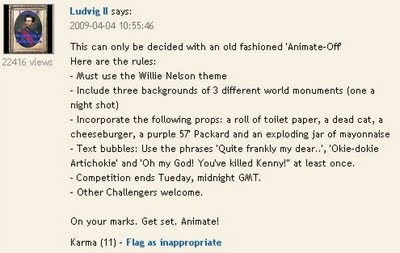 The publishing date for animations is November 16, 2009 so if you're reading this before that date and are a GoAnimate member you might like to consider entering. Click on the links in the animation for your animations requirements and information for how the winner is chosen. 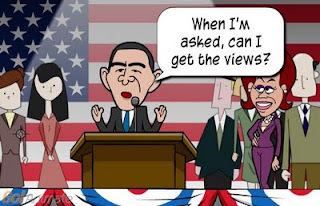 The previous incarnation of the competition was purely who could get the most views on their animation would win. This has been a common way to run competitions (including official ones) on GoAnimate that I wanted to address because it favors animators with the most fans and all time views. Hence, to give lesser known animators some hope, I've combined views with a voting system that can be manipulated to favor more resourceful animators if they so choose. It's not necessarily fairer but it should make the out come a lot less predictable. I announced this competition in the GoAnimate forums where you can follow the competition and read some of my humorous tips for winning. I'll also be featuring the winner and perhaps the runner ups too in this very blog. The winners will be announced on November 30, 2009.